Monarus is a Bakugan that resembles a butterfly. 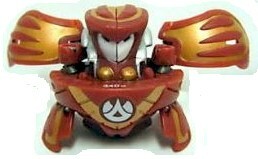 It is one of the fastest Bakugan thanks to its large wings and ultra light weight. It has the ability to fly beyond gate cards. Its enormous butterfly wings create a mighty hurricane wind to defeat opponents. Purchase Monarus from Amazon now!